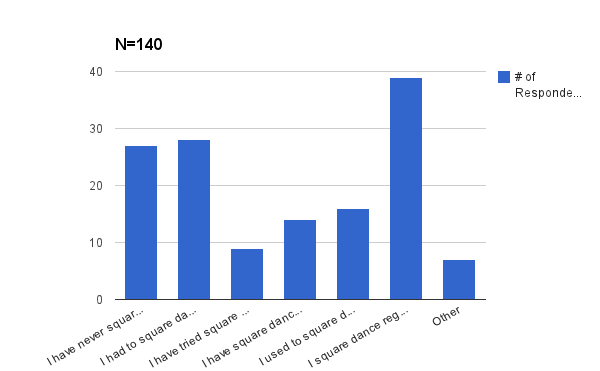 Here are some of the tentative results of the 2014 Survey on Interest in Square Dancing. 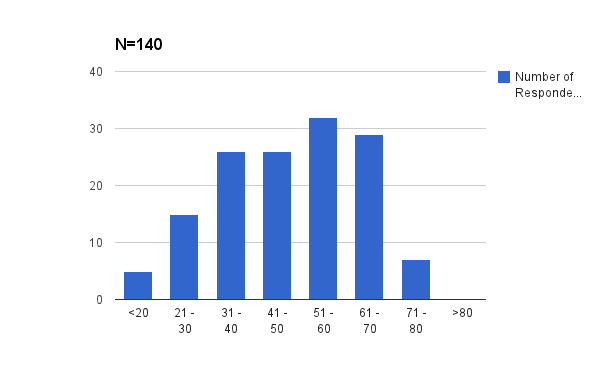 I will add more details as I compile the results. 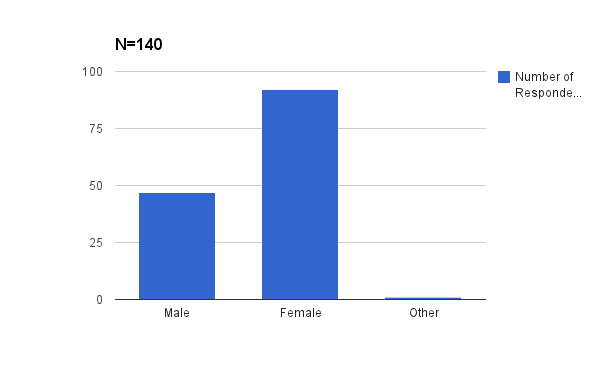 These are the results from the first 140 respondents. The survey is still open, so feel free to add your comments, especially if you are a non-dancer! Please be aware that this is country of residence, not country of citizenship. How many times have you square danced in your life? I have never square danced. I had to square dance at school, but have never square danced outside of school. I have tried square dancing once. I have square danced a few times. I used to square dance a lot, but I haven’t danced recently. If you have never square danced, or if you rarely square dance, what is the reason? What about square dancing would need to change in order for it to become more appealing to you? Can’t stand it. It’s square. Change the name, get rid of bombastic callers and get rid of the committees who ruin square dancing. Clubs need to support each other. Combine with tap dance or clogging. Don’t know really. Never thought of it. Everything. This is not a stupid jokey answer either. First you’d have to make me willing to dance at all. Then you’d have to make it not so “country”. I don’t like spinning, so if square dancing gets less spinning, I would try. I have never seen a square dancing class, presentation/demonstration or heard anyone talk about it. I guess the opportunity to try it would be the first thing that would have to happen. I love dancing – I love ballroom dance, but I have never heard of square dancing! I need to be a little lighter on my feet and a few years younger. I square dance regularly, but so many I hear talk about it, their reason for not dancing is that they heard its to formal and they don’t want to wear the fancy clothes. Although I tell them not all clubs require it, the intent is still there so they don’t want to make that investment. Also, although they are hoping for a younger crowd. I think I need more accessible resources (videos and literature) to feel more up to learning and continuing to square dance. I would love to square dance, but I don’t really have the time. I tried ballroom dancing about 15 years ago, and I had the same problem then. Perhaps I should make time for more hobbies…I do like the music though. I’m not a fan of any kind of group dancing (line, Scottish, etc), so I don’t think there’s much that can change about that. If there’s any non patronizing free lesson, I’d like to square dance. In England at least in uni we had a lot of ceilidhs which everyone really loved, but most people didn’t know the right moves. There were lots of other dance classes but not for this type of dance. So, opportunity to go to a class would be good. In the 40+ group cool or not cool so he not so important. Link it to weight loss and meeting people and you will be on to a winner! Is there a way that my young boys (ages 6 and 10) could also participate, I would be more interested. It already appeals to me. I would do it again if I had a chance to! It needs to take less time to learn. Nine months of lessons is too long. There needs to be fewer calls at the entry level dance program. It’s not that I don’t like it, or it’s not appealing, I’m single, so I don’t have a partner, and I just never got involved in it after learning it in the 4th grade. It is something that seems interesting enough, and if I were in a relationship, I would probably try it again. More time in my schedule, and more people I know square dancing to encourage me. I don’t want to dance with a bunch of older strangers. My husband hates dancing of any kind. I would need to rent a partner. Perhaps a local chapter that does stuff? (or a way to find it). I’m in zip code 15656 for instance, and a quick google check didn’t find any. The top hits are for the generic local.com, all kinds of dancing. Saturday night dances are difficult for those of us who have an early call for church on Sunday. See, square dancing in my mind is a traditional form of dance that is culturally rooted in white Protestant settlements in North America. While that’s an interesting cultural group in itself, I would feel as weird joining a Square dancing group as I would a Sioux Hoop dancing group, or a Japanese Bon dance group. Kinds of dance that have crossed over into general popularity are belly dance and hip-hop dance. Since I like dancing, square dancing looks quite appealing and I am willing to try it out. The only thing is my tight schedule, since I am committed to another type of dancing. Sorry, nothing. I am not interested in it…maybe beer!? Specifically beginners’ classes targeted at people with some mobility issues, like ‘gentle’ yoga classes. Drop-in classes. Location convenient to me as I am dependent on public transit. The music. the stereotypical crowds of old people, white country bumpkins, yolkles. I will admit my personal experience with people who enjoy square dance halls has given me a stereotyped view. I’m not fond of being around large numbers of conservative, religious people, though I’m sure the crowd has become more diverse in some regions. Younger people and maybe hipper music. It just seems the thing for retirees to do to keep busy and in shape. I might like it – I really enjoy line dancing and the music isn’t too different – but I think the outfits and impression have to become ‘modernized’ or at least more youthful before younger people will join in. 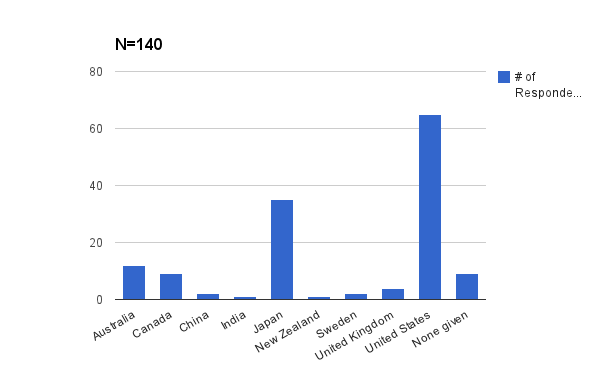 in japan, little chance of finding a group in my area. would be fun to do at this age. not so demanding as mexican folklore. would like to take lessons from an instructor who knows how to make it look good. don’t want to be just ‘stomping’ around. if i’m going to do it, do it well. it would be nice not to have to buy and constantly wear the square dance clothing. You get thru lessons and then you are expected to spend $200 for matching outfits – it is to expensive for some people. They would like to go to dances and it is cheap entertainment but the cost of the clothing makes it very much not affordable for some people. They need to rethink their policies. more couples and not just horney old men. Do you have any other comments that you would like to share about square dancing? I like the wear and the music and would love to learn to yodel too. I really like square dancing because of its social nature. Its made a great change to my emotional health and social life. Square dancing was actually one of the best new things I’ve tried, and I enjoyed being able to meet different people and do different things. Belly dance and hip-hop, and even flamenco have roots in a marginalized culture which give them a ‘cool’ factor. White Protestants in North America have not yet been a marginalized group; there is no ‘dark underbelly’ of square dance. Well, on second thoughts maybe there is, but nobody knows about it. If you want to make square dancing cool, you need a documentary showing its dark side! I associate the idea of square dancing with line dancing, shuffleboard, bingo, etc., not that it’s specifically for old people but that older people do things in groups that are led by callers, instructors and the such. Conformity is not for me. Thank you. From an early age I viewed square dancing as something unhip… Something my friend’s parents did. I liked them but had nothing in common with them, from the “costumes” to the music and the whole atmosphere. I watched it on TV and instinctively knew it wasn’t for me. Like the type of Country and Western shtick with what I called phony American plastic culture “Square” mentality. Give me any other type of dance but not this. I have no problem with other people liking it. I simply don’t (like it and what it represents to me). The name itself is “square”. I think it says it all. I could be persuaded to try it once or twice but not regularly. I did square dancing a bit when I was young and I loved it, even the memory of it makes me smile. I do think it’s pretty cool, just not something I enjoy. I’m more solitary. I really enjoyed square dancing but got busy with life and never got back to it! I think it’s great but just haven’t had the time to get into it. I think many people don’t appreciate how interactive it is because they don’t appreciate physical interaction like they used to. I’m not into dancing as it is, but I think of square dancing as being pretty simple movements, where the crowd is all doing essentially the same thing in unison. That appeals to me even less. If this was swing dancing, I would be more inclined to join. It looks to me that many of the callers that you are sharing this survey with don’t even teach square dance classes. Many of them haven’t taught a class in at least 10 years. It seems like those who do it, love it! It’s “square” but still fun and good exercise. It’s a lot of fun, but looking for more to get involved. It’s fun and the people are so friendly. It’s not that I’m averse to square dancing. I just have other priorities. Maybe square dancing needs to be promoted more to singles as I didn’t realize that you didn’t need a partner and went line dancing but thankfully I found square dancing 5 years ago and dance nearly every day of the week. My other thought is that some callers push their learners thru far too quickly so it becomes too hard too fast and they quit because it becomes just too hard for them and they don’t enjoy being pulled around. Not really. It is fun, and if you are with someone that likes it or is open to the idea of joining, it would really be a lot of fun. I know it is good exercise, also. (I had knee replacement surgery and I don’t know if I could do this even if I wanted to). I think it’s an awesome dance! Promote causal clothing as an option. Square dancing is great in so many ways. It involves social interaction, intricate movements, and just plain joy! Square dancing is one of the most fun activities I have ever done. There are so many great people you meet. There are lots of fun things to do and places to go. The people who do it seem happy. Torture in JHS… don’t need to revisit at this point in my life. Traditional square dancing is relevant to a few specific cultural groups (mid-west, Metis). I occasionally participate in similar dancing that applies to my Scottish heritage. We’re deluded into believe that square dance friendships are solid, yet the plain fact is that the friendships are VERY flimsy. Callers have no morality whatsoever. Dancers have no loyalty. We reward mediocrity (because it costs less) and we punish excellence (because it costs more). The activity shrinks each and every year. There has never (in the last 40 years) been even the slightest year-to-year growth in square dancing. It’s a doomed ship and some people insist on riding the Titanic all the way to the bottom of the ocean. it’s time to keep just the MOVES, and discard everything else, and rebuild a new activity based solely on the REAL part of square dancing (i.e. the moves). Everything else about square dancing is just an antique relic. hate the mad dash to round up but being a single women that’s what I would have to do. I don’t mind dancing as a male but not all the time. I would love to get back into round dancing but once again being single this is not so easy. remember watching my farm community members doing it at the community library awaaaay back when. they were really into it. we kids had to get out of the way or be tromped on. they looked like they were enjoying themselves so much. it was fast and furious. you really had to know the different steps and calls. that is a precious authentic memory to me.